I don't know if this is true everywhere, but here in Minnesota, homemade treats are not allowed in the classroom. I think it stems from allergy concerns, which I understand. But it bums me out a little when my child has to bring in store-bought cookies or cupcakes to celebrate their birthday or some other special occasion at school, instead of a fun, creative, often-healthier homemade snack. 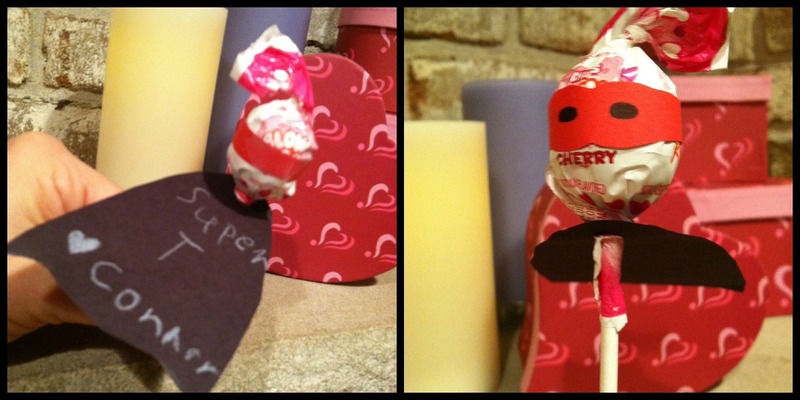 Last year, we set a new benchmark for fun homemade Valentine's. And they were easy. Maybe that's because they both begin with store-bought candy. But that's OK, because it simplifies the process, so you can focus on the customization. The best thing about these Valentine's is the personal touch your kids put on them. Connor (a second-grader, at the time) made these Superhero Suckers. We found the idea and the template for the cape and mask at Family Fun (now Spoonful.com). 3. Have your boy write his message on the cape. (We used a gray crayon to write on the black paper.) Use a hole punch to make a hole near the neck and slide it all the way up the sucker stick; the hope is the wrapper will hold the cape up. 4. Color in the eye patches on the masks and wrap around the sucker and secure with a small piece of tape. 5. We used a square of Styrofoam to store and transport our assembled Superhero Suckers. Stuffing them all into a bag would have ruined their costume. 1. This is a harder craft. Spoonful has good directions, with pictures, but don't attempt this unless your child has a bit of tenacity. Making Valentine's should be fun, not stressful, you know? 2. We used Kisses leftover from Christmas. (I know! Should I even admit that on the Internet?!?) The silver ones look best, obviously; they are the most diamond like. But Natalie thought the red and green ones looked jewel-like too. So we went with it. 3. 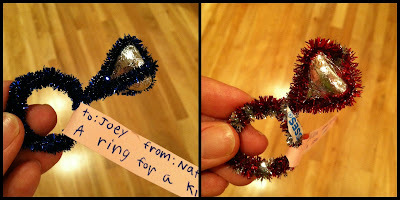 Spoonful recommends using a hole punch to make the labels easier to wrap around the ring. That was hugely helpful. If you're looking for other creative Valentine ideas, this one detailed by Kristen Howerton is super cute and very popular. And I adore this sucker + mustache or lip combo. Have any other Valentine's ideas or links to share? I'd love to see what you're making. Cute ideas! My boys would love the Star Wars idea! I bought a box of the cheap-o regular ones for each of my boys to take to their Valentine party tomorrow (30 valentines each). I'm almost 39 weeks pregnant (will be Wednesday), so I'm avoiding any kind of extra work. We are getting out the craft supplies tonight though to make Valentine's to mail to their grandparents tomorrow. I do plan on making our traditional chocolate chip, heart-shaped pancakes Thursday morning. And since we have church on Thursday night, I'm making our special family dinner Wednesday, roast chicken, sweet potatoes, green beans and heart shaped brownies with fresh whipped cream and berries for dessert! Last year we did make these cute monster mailboxes for them to collect their Valentines in.